Why CRM for Construction Company is Crucial? Which One to Implement? The Great Recession was catastrophic for the global economy as nearly all the leading market sectors faced significant revenue decrease. Today, industries tend to grow again. Construction companies which are historically strongly linked with housing and real estate suffered from the US subprime mortgage crisis in 2007-2010 but now they also move back to high profits. 2018 was pretty successful for the construction industry because it added nearly 280,000 new jobs, lowered workers’ deaths, and attracted venture capital. 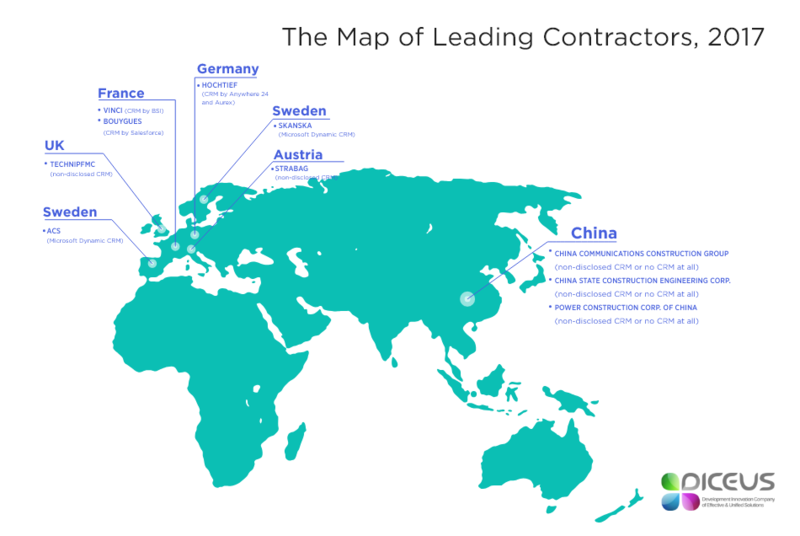 Precisely, ConstructConnect reports that the total construction spending was around $1.31 trillion or 5.4% more in comparison to 2017. The forecast for 2019 is $1.37 trillion. However, growth rates slow down which means that enterprises have to find advanced approaches to remain profitable. One of such tools is CRM for construction company – software which focuses on attracting and retaining customers. Further, we will explore the idea behind CRM, key advantages of such systems, and the best products. Let’s begin with a plain but essential idea: all businesses which work with either individuals or entities and earn money through this interaction have to maintain their relations with clients. Especially, it’s valid for industries with high spending. Thus, construction management software is mandatory as potential faults will result in insane expenses, loss of reputation, and even bankruptcy. 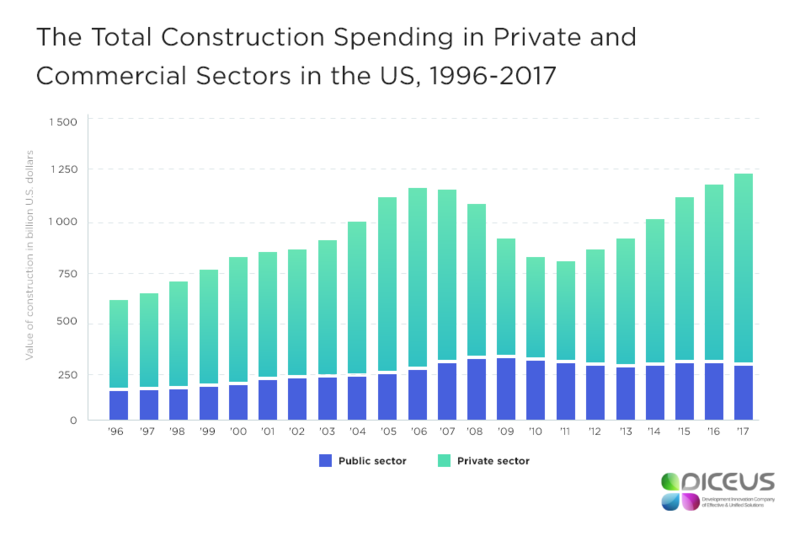 To realize the value of the industry, just check insights on the total construction spending in the US from 1996 to 2017: the last year features more than $1.2 trillion ($280 billion for public sector and $951 billion for private one). Amusement and recreation: +5% spending. Power and energy construction: -5% spending. The problem is that a lot of companies have significant issues with the digitizing process. As McKinsey reports, nearly one-third of the gap is related to this stuff so far as businesses slowly and poorly introduce digital assets and workflows. Roland Berger notes that corporations can benefit most from this digitization. Hence, both on-premise and web-based construction management software may be a real finding because it’s all about digital management and personalized approach. Read more about CRM software, its definition, and key features. Construction/project management. Set and track tasks, use electronic records with e-signatures, set alerts, and access to integrated data related to plans. Business project management. Get suitable BPM systems to check and modify past, current, and upcoming business processes. Warehouse management. Always know about your resources, check available materials and workers, track their movements. Job costing/estimation. The title says it all. Check the price of any procedure or deals, track receipts and reimbursements, evaluate time costs. Budgeting module. Finally, calculate salaries, create financial reports and balance sheets, manage cash flow, and so on. With it, you can easily oversight and control everything from the building process to finance while your workers and clients will get access to key data. Hence, all parties will feel engaged. Strengths of CRM for any sphere are pretty similar because the system is focused on the general streamlining of all your processes. There are various tools for different industries but we will focus on four primary advantages of CRM for construction company. Using old-fashioned Excel sheets or even paper documents to track tasks is extremely inefficient. Modern CRM let your sales reps keep in touch with clients and always know even the smallest details of any given project. Using digital systems, you can monitor bids, new leads, marketing campaigns, follow-ups, and so on which means your corporation will be more profitable without unnecessary fails and losses. What projects you have and what are bids for them? What stage of the sales process is now? Who is responsible for projects? Which tasks you’ve finished and what you have to do later? Be honest, you can’t answer them without software. Documents, contact info, historical data, analytics, reports – construction management software is universal when it comes to getting data. Moving further, let’s talk about automatic stuff. We bet that your employees monitor sales, relationships, contracts, and warranties manually, as well as they conduct marketing campaigns, and check expenses. 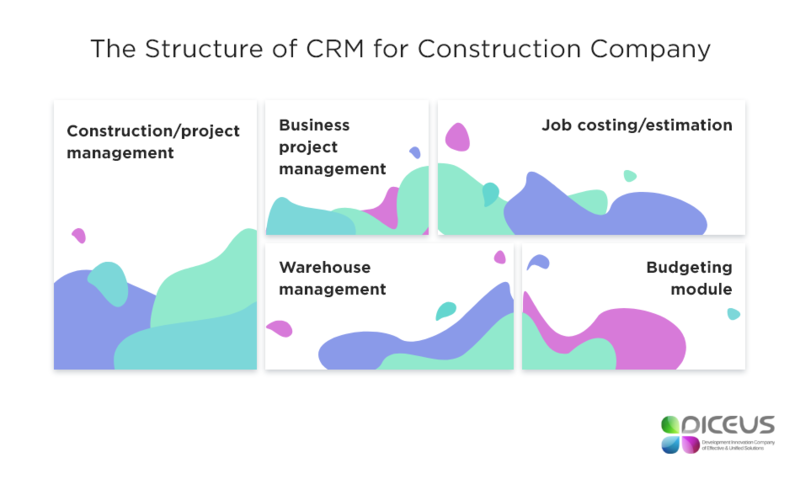 CRM for construction company makes these things automated: the system cares about small tasks, daily alerts, notifications, and calculations to free up managers and let them do more creative work like real interactions with customers. Finally, the basic benefit of any CRM is the optimization of processes. Using such managerial tools, you are able to speed up everything using already mentioned automating, simple tracking, and all-around data coverage. Web-based construction management software frees up resources while stand-alone solutions adapt to your requirements making the business even more efficient. As you remember, the excellence of CRM depends on your needs. Some companies are happy with free basic software because they just don’t require more complicated stuff. Large enterprises want to get all-in-one solutions, although. Means, before choosing and ordering a product, you should evaluate the performance, set goals, and check what you really need. Then, you may want to look for the general features of any CRM for construction company described earlier. Finally, if you have a dedicated expert, consult with him or her. This person will integrate the system and import data from your previous platforms, so be sure that he/she is comfortable and familiar with the chosen product. ACS (Spain) has unnamed computerized CRM. Hochtief (Germany) partners with Anywhere 24 and Aurex. Vinci (France) uses CRM developed by BSI. Bouygues (France) works with Salesforce but for the Telecom department only. Skanska (Sweden/Czech Republic) implemented Microsoft Dynamics CRM. Simultaneously, Strabag (Austria) and TechnipFMC (the UK) have CRM managers but also don’t reveal which software they’re using. Web-based construction management software. These apps are fully controlled by creators who share them with clients. Cloud solutions are cool because you don’t have to care about deployment and tuning them but they are pretty limited when it comes to customization. On-premise CRM for construction company. These products are based on your own server, so be sure that you have enough resources to maintain them. Usually, developers allow modifying on-premise CRM. Plus, such systems are a bit more secure because you protect local storages and don’t rely on third-party clouds. Ultimately, it always depends on your company’s purposes, so be sure to find the best product with perfect integration and support. If you need something unique, contact us and we will discuss all requirements to create the ideal CRM, help you to import data, test software, and maintain the system afterward. We always focus on the best result and feature quote-based prices instead of hourly rates. When it comes to choosing CRM of your dream, it may be difficult. But spend some time to find the perfect match, so you will avoid a lot of pain during the integration stage. Knowing the company’s goals, you will be able to install CRM without the need for future costly upgrades, as well. If you focus on ready-made products, remember that developers charge monthly or annual fees per user. Prices start from $25 for read-only plans (reports and dashboards) while standard solutions cost approximately from $50 to $100. Also, remember about launching fees which start at $1000. Still, we suggest considering fully-customizable CRM for construction company. Our team creates such systems to meet requirements of even the most complex corporations with unusual business tasks. You can specify all needs, and we will calculate the project’s cost without hidden fees. Contact now to get the product!